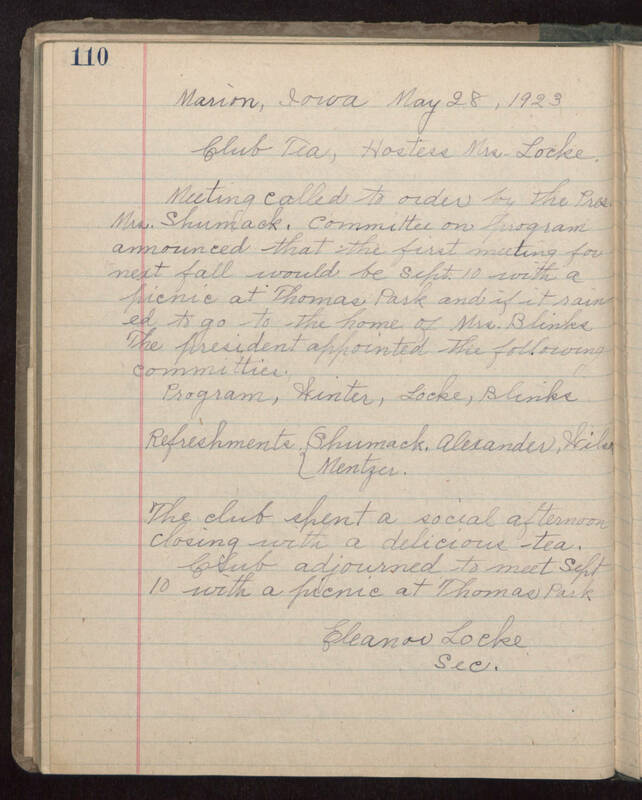 Marion, Iowa May 28, 1923 Club Tea, Hostess Mrs. Locke Meeting called to order by the Pres. Mrs. Shumack. Committee on program announced that the first meeting for next fall would be Sept. 10 with a picnic at Thomas Park and if it rained to go to the home of Mrs. Blinks. The president appointed the following committies. Program, Winter, Locke, Bliks Refreshments: Shirmack, Alexander, Wiler, Mentzer The club spent a social afternoon closing with a delicious tea. Club adjourned to meet Sept 10 with a picnic at Thomas Park Eleanor Locke, sec.